Is the Phillip's Curve Dead? What exactly is the Phillip's Curve? I can give you a hint, it is not a yoga position. 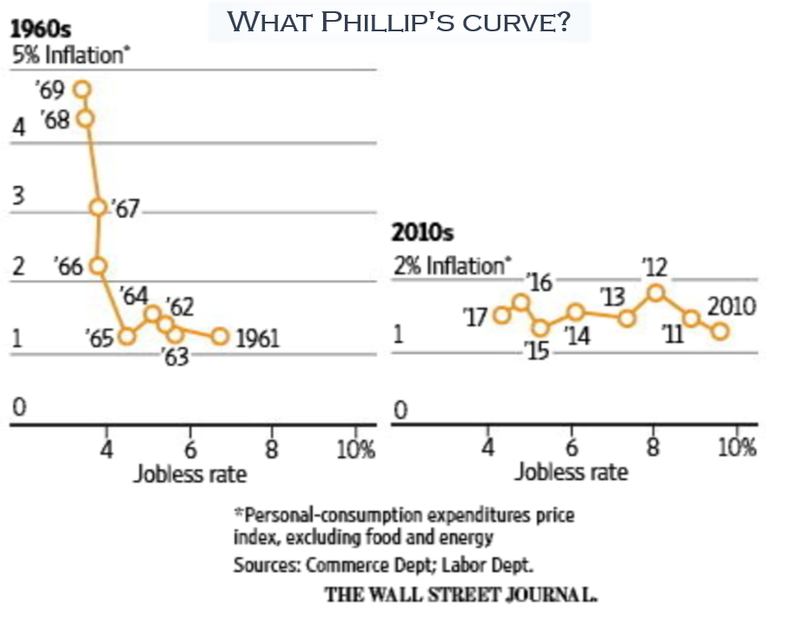 The Phillip's Curve is a economic relationship, discovered by William Phillips, used to describe the rise of inflation as the unemployment level falls. This curve has proved its merit over many cycles. What causes this relationship, in other words, why does inflation pick up as unemployment falls? Well, as the labor market tightens, employees are put in a better position to negotiate wages, their higher wages allow them to purchase more goods, rampant demand for more goods then enables employers to raise prices without a significant impact to their sales volumes. And the cycle continues.... The conundrum - at today's unemployment levels, why are we not seeing meaningful inflation growth? But why aren't we seeing this phenomenon this cycle? One explanation is globalization, where a lower production cost overseas gives other countries the luxury of producing profits with a lower sales price (in U.S. dollars) and thereby exporting deflation across the globe. Another explanation is technology, or the "Amazon effect." With technology, consumers price shop, read reviews, and are more knowledgeable prior to making a purchase. This reduces the sellers's ability to charge a premium simply due to the customer's lack of knowledge. Also, bringing costumers to one location (i.e. Amazon) increases the price competition and forces sellers to operate on thinning margins with lower selling prices. As you guessed, this reduces inflation pressures. Finally, a deceleration in the cost of health care may be a third reason we are not seeing profuse inflation this cycle. According to the Bureau of Labor Statistics, health care costs make up about 9% of the consumer price index (most common inflation measurement). It's true that within the consumer price index, medical costs have increased about 2000%, yes that was 2000%, since 1960 while the price of all other items has only gone up about 700%. Given this backdrop, you may be asking why health care is not contributing to inflation? The answer lies within the measurement of the medical care bucket of the CPI. This bucket is broken down into four categories, professional services, hospital and related services, health insurance, and medical care commodities (includes prescription drugs). 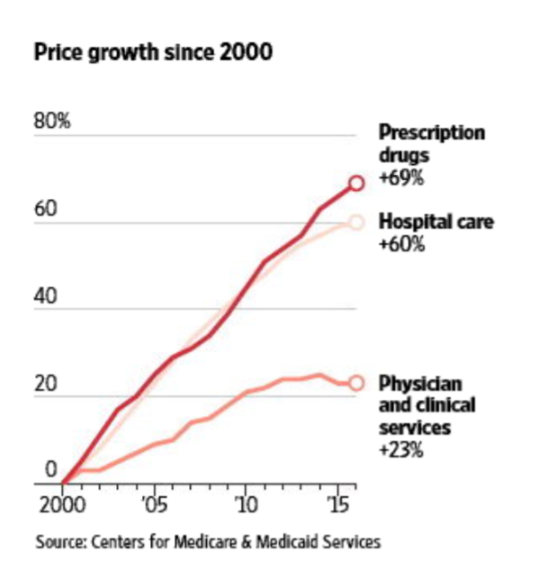 Consumer price increases were widespread prior to the recession in 2007, but have since petered with the exception of prescription drug prices. Bear in mind, this is the consumer price index and not the consumer + government price index - which would look quite different. The Phillip's Curve conundrum will certainly be on the top of economists mind until we begin to see inflation well above today's levels. Until then, enjoy the healthy job market and low prices!